Glenavon produced one of the most memorable performances in the club’s European history to secure a memorable 2-1 victory over full-time Molde and hand Irish League football a major boost. Rhys Marshall and Josh Daniels grabbed the goals to send Gary Hamilton’s side into dreamland as Glenavon battled back from a 1-0 deficit to register a magical Europa League first-leg advantage. Molde landed in Northern Ireland with manager Ole Gunnar Solskjaer in the spotlight thanks to his heroics as a Manchester United legend. However, 90-plus minutes of hard work and heart from Glenavon left Hamilton’s men centre-stage. The gap between a full-time Molde side bolstered by impressive domestic form and results was closed thanks to the collective commitment on show from a part-time and depleted Glenavon side missing some established players. The 1-1 scoreline at the interval proved a fitting reward for that commitment as Glenavon’s rapid recovery from falling behind on 35 minutes arrived within moments. Fredrik Aursnes’ drilled close-range finish broke the deadlock off a clever backheel flick by Petter Strand that marked the first occasion in which Molde had managed to cut open a disciplined Glenavon outfit marshalled by the excellent Andrew Doyle. 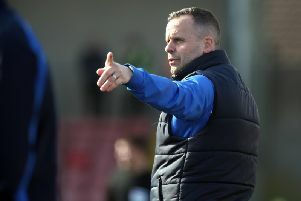 The goal arrived as a cruel interruption to Glenavon’s most positive period of play, with the hosts growing in confidence as play progressed led by the livewire Mark Sykes. However, the Lurgan Blues left it level within seconds when Andy Hall’s corner-kick was met on the run by a rising Marshall. Daniels grabbed his moment on the hour mark when the energetic Marshall burst forward fromm deep and picked out the winger, who slotted home from wide to send Glenavon on the path to glory. A penalty kick on 85 minutes handed Molde a path back into the tie - but Aursnes dragged his spot-kick wide of the target and the night belonged to Glenavon. GLENAVON: Tuffey, Marron, Doyle, Grace, Daniels (Jenkins, 94), Marshall, Sykes, Hall, Donnelly (Norton, 71), Muir, Murray (King, 91). Subs (not used): Taylor, Harmon, O’Mahony, Hamilton. MOLDE: Linde, Gabrielsen, Forren, Sarr, Strand (Brustad, 69), Hussain (Chima, 61), Aursnes, Hestad, Remmer, Haugen, Haland (Svendsen, 80). Subs (not used): Ranmark, Gregersen, Mostrom, Wadji.